I could have easily created 60 pasta recipes in this book, but I only have a few, so I need them to be special. Go to your local grocery store and get yourself the softest, creamiest goat cheese they have because this cheesy pasta recipe deserves it. It is a great meal for a nice springtime lunch with friends or family. I love this pasta dish because the goat cheese has a big presence, and as a no-sauce pasta, it is much lighter for the spring or summer heat. 1. Roughly chop the rapini. 2. Bring a large pot with 8 cups (2 l) of salted water (I suggest sea salt) to a boil over high heat. Prepare a large bowl of ice water. Add the rapini to the boiling water, and cook for approximately 4 minutes or until tender. Using a slotted spoon, transfer the rapini to the ice water. Chill, then drain the rapini. Pat them dry using a paper towel. 3 minutes or until golden. Add the chili flakes, and cook, stirring constantly, for about 45 seconds to allow the flavors to infuse. Add the rapini, toss to combine the ingredients, and remove the pan from the heat. 4. Bring a medium pot of 6 cups (1.5 l) of salted water (again, sea salt is best) to a boil over high heat. Add the pasta, and cook for 1 minute less than the package’s instructions specify. 5. Drain the pasta, and transfer it, along with the rapini, to the large skillet. Add the lemon zest, and turn the heat back on high. Toss to combine all the ingredients, cooking for about 1 minute, then season to taste with sea salt. 6. Divide the pasta between your serving bowls, and add a big spoonful of goat cheese to each. 7. Let the heat from the cooked pasta get the goat cheese rich and creamy, and enjoy. 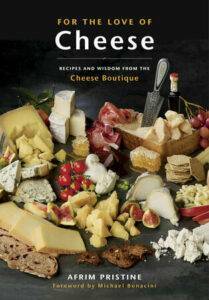 Excerpted from For the Love of Cheese: Recipes and Wisdom from the Cheese Boutique by Afrim Pristine. Copyright © 2018 Afrim Pristine. Published by Appetite by Random House®, a division of Penguin Random House Canada Limited. Reproduced by arrangement with the Publisher. All rights reserved.